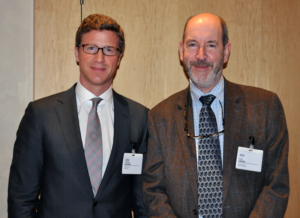 Christian Kaeser (left) and Chris Lenon take on a new role as ICC Taxation Commission Vice-Chairs. Mr Kaeser joined Siemens AG in 2002 and was appointed Global Head of Tax for the Siemens Group in 2009. He commenced his professional career at a German based tax advisory firm after having worked for several years as an assistant professor at the University of Mainz. “Business goes global, taxes stay local. It’s ICC that bridges the gap,” he said. Mr Kaeser is also Chairman of the supervisory board of World Tax Services and a member of the faculty of the Institute for Austrian and International Tax Law at the University of Economics and Business, Vienna. Mr Lenon chaired the taxation committee of the Business and Industry Advisory Committee from 2010 to 2012 and has chaired the Green Tax Group for Business Europe from its inception in 2008 to date. Mr Lenon was Global Head of Tax for Rio Tinto from 1993 to 2010. He focuses on Environmental Tax, Sustainable tax planning, Transparency and Transfer Pricing. The two new commission officers take over the reins from Jean-Marc Tirard and Barbara Kessler who have served as Vice-Chairs on the commission for 24 years and 7 years respectively.